Wing span: 1 1/4 - 1 5/8 inches (3.2 -4.1 cm). Identification: Tailed. Upperside iridescent blue with black borders. 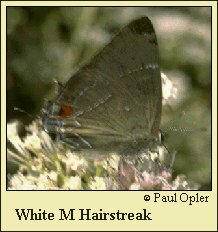 Underside grayish brown; white postmedian line edged with black and forming a white M (or W) near tail; white spot near base of costa. Flight: Three broods in the north, four in Florida, from February-October. Caterpillar hosts: Live oak (Quercus virginiana) and other oak species. Adult food: Nectar from a variety of flowers including viburnum, sumac, sourwood, wild plum, poinsettia, sweet pepperbush, common milkweed, lantana, dogwood, and goldenrod. Habitat: Woods with broadleaf trees. Range: Connecticut west to southeast Iowa and Missouri, south to east Texas, the Gulf Coast, and peninsular Florida. Rare stray to Michigan and Wisconsin.